Looking for flooring removal services in the West Palm Beach area? Dustbusters Floor Removal offers flooring removal services for all of South Florida! Whether you need residential or industrial flooring removal, we can help! Removing all types of flooring in a safe, efficient, and professional way gives you the opportunity to get your flooring projects done sooner! And, our dust-free technology lets us provide you with our flooring removal services with absolutely no harmful construction dust left behind! Dustbusters Flooring Removal offers a completely dust-free floor removal package. But, what does this mean? Construction dust brought about by removing all types of flooring can be spread throughout the entirety of a home or building. And, it can stay in the air for days, being breathed in by anyone who enters. But, this dust doesn’t come without consequences. It can likely contain harmful chemicals and lead to a number of health issues. Also, since dust can take days to settle, it’s a hassle to clean up after. Skip the potential health hazards and the clean up–let us to the dirty work for you! We provide expert floor removal services for all of South Florida, including West Palm Beach. And, we provide free quotes for our services. The floor removal process includes a free quote, a licensed crew of professionals, dust-free technology, free debris hauling and trash service. 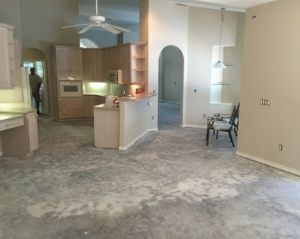 Most floor removal projects can be completed within a few hours, so you don’t have to worry about staying on time with your project deadline. Furthermore, you don’t have to worry about renting trash dumpsters since that’s included in our pricing. Finally, once we leave, your flooring is immediately ready for install! There is no cleanup, no fixing subflooring, or anything else you have to worry about on your end! Dust-Free: As mentioned, dust can lead to a number of health consequences. Not to mention, it’s a pain to clean up after. With Dustbusters Floor Removal, we remove any type of flooring with our dust-free system; leaving no cleanup or health hazards for you to worry about! Ready for Install: We understand that you’re excited about your new flooring. But, all too often, when individuals attempt to remove flooring themselves, they end up with damaged subflooring or running into additional problems. Choosing a professional floor removal service means that your flooring will be ready for install as soon as we leave. Fast: Most of our floor removal projects take hours to complete. Rather than spending days on your hands and knees chipping up tile, invest in a few hours of professional flooring removal. Remember, time is money! Spend both more wisely with professional flooring removal. 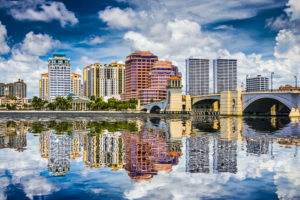 Need flooring removal in West Palm Beach or another area in South Florida? Choose Dustbusters Floor Removal for a dust-free method to having flooring removed! Contact us today to find out about getting a FREE, no-obligation quote!